As the season of reflection is upon us, it’s an ideal time to explore how much our industry has changed — and what lies ahead. As someone who has been in publishing and marketing for many years, I have seen the industries evolve a great deal. What can enterprise marketers learn from publishing and marketing organizations? 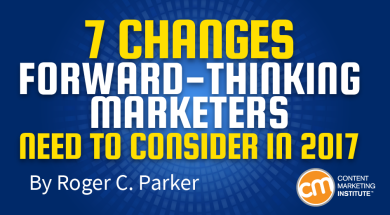 Here are seven changes those industries have experienced — and what specific actions marketers can take to improve their content marketing programs in the coming year. Companies often posted video recordings of their free webinars that are available indefinitely. However, I have spotted a trend in which companies limit the availability of the recorded webinar to 24 or 48 hours so they can promote the opportunity as “view now or lose the opportunity,” creating a sense of urgency for prospects. What forward-thinking content marketers should do: Offer time-limited access to some content, such as webinars, to motivate attendees to take action in a short time span. Don’t think prospects should be able to watch whenever they have the time (they likely will never have the time or they’ll forget when they do have time). Marketers have escalated their willingness to involve prospects and clients in the content ideation and production process. Author Ryan Levesque detailed this initiative in his 2015 book, Ask: The Counterintuitive Online Method to Discover Exactly What Your Customers Want to Buy…Create a Mass of Raving Fans…and Take Any Business to the Next Level. Though marketers have been using free and low-cost email survey programs to ask basic questions to gain general input for years, Levesque’s Ask formula shows that there is a point when marketers recognize the exponential value in asking their audience increasingly detailed questions that can fuel their product and service development. What forward-thinking content marketers should do: Break the “I-am-the-expert” model, and replace it with an ongoing process of using your audiences as the true experts in your content development. What sets 500px apart is its Quests feature. Marketers can define the photographs they’re looking for and incentivize photographers to take photographs that meet their criteria within a specific time. 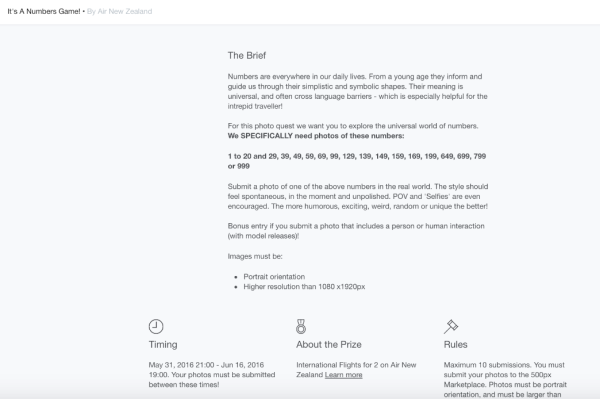 Air New Zealand used this crowdsourcing photography site for It’s a Numbers Game. In this case, the qualifying photographer received air travel for two from anywhere in the world to New Zealand. What forward-thinking content marketers should do: Think beyond the obvious, i.e., commissioning custom photographs or searching online stock photo galleries. Instead, consider sourcing content from those who want to produce it (for the challenge or chance to win the prize) and gain the promotional benefits. The use of direct-marketing tactics by content marketers is reflected in the trend toward simpler home pages offering a provocatively titled incentive with a newsletter sign-up form at the top that doesn’t even require a visit to a landing page. What forward-thinking content marketers should do: Simplify the promotion of your list-building opportunities. Like direct-marketing professionals do, make your call to action easily understood and clearly visible in a prominent place. An increasing number of sites are designed to focus the visitor’s attention on the primary content, often the latest blog post. Sidebar clutter is reduced and fewer navigation options at the top are offered. In many cases, a “hamburger” icon is provided for users to click if they want to see more site options. 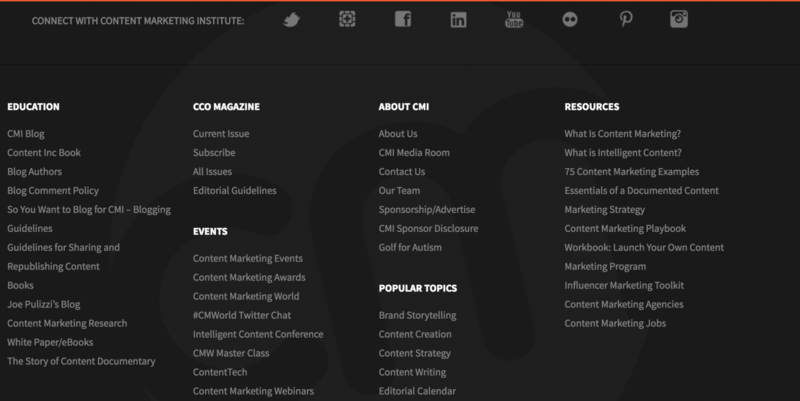 Additional, task-specific navigation options are increasingly offered in the footer (scroll down to see the CMI footer on this page). What forward-thinking content marketers should do: Analyze the trend toward simple, focused sites like Andrew Davis’ Brandscaping book and Rafal Tomal’s website, which tell the whole story in a single screen. Some of my favorite newsletters are brief, frequent compilations of curated links to blog posts, similar to the kind sent by Marketing Insider Group. It offers links to posts on its own as well as other sites. 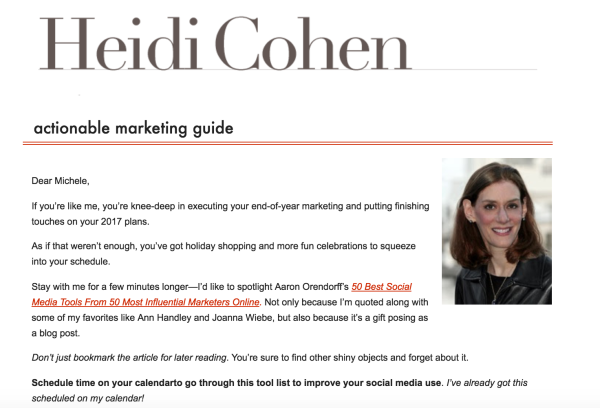 However, room still exists for thematic or personality weekly emails, like Heidi Cohen’s Actionable Marketing Weekly Newsletter. Her newsletters begin with a personal story, often about living in New York City, plus links to her recent blog posts, upcoming author interviews, and book giveaways. What forward-thinking content marketers should do: Be aware of the range of available newsletter options, and commit to a content formula that reinforces your brand and balances curation and frequency. I have been crusading against the prevailing view of content as an ongoing series of disconnected topics rather than monthly themes addressing different perspectives. Taking a theme approach starts by selecting a category for each month’s content and choosing topics for individual blog posts, podcasts, guest posts, etc., that relate to that theme. What forward-thinking content marketers should do: Choose monthly themes broad enough to be addressed in both long- and short-form content, as well as in different formats. Ideally, each of the monthly themes should be viewed as the building blocks of a yearly book, event, or training program. As content marketing changes, marketers who monitor and adapt to new strategic and tactical trends that they learn from related industries will better serve their audiences. In turn, their audiences are more likely to be attracted to and consume the content from those brands, and to see them as valuable, trusted resources. What changes are you seeing that affect your content marketing efforts? Want to stay on top of trends and get tips on adapting your content marketing program? 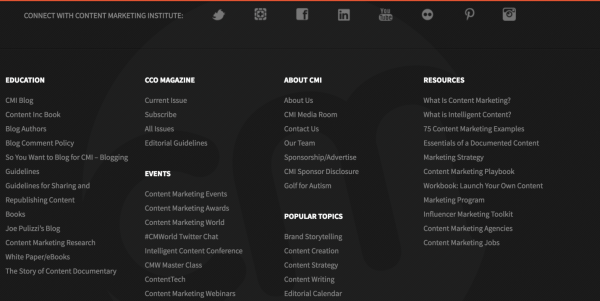 Subscribe to the free daily CMI newsletter.